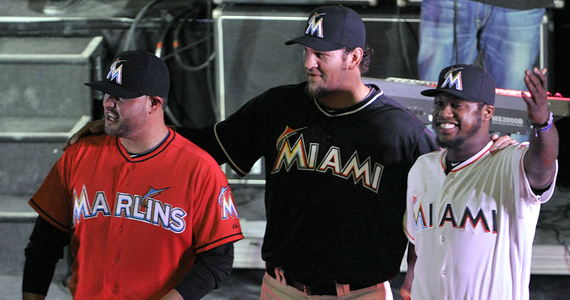 Are the Marlins’ New Uniforms So Bad? Allow me to introduce you to yet another new member of the Jobu’s Rum staff, Dixie Monroe. Dixie has brought her southern charm and impeccable sense of style to the blog in the hopes of classing us up a bit and letting us know what horrible fashion atrocities are going on in the world of sports. Welcome Dixie! On November 11th of last year the Miami Marlins revealed their new logo, color scheme and uniforms. The intention was to give themselves a new identity along with their shiny new stadium… Ya know, do a little rebranding. Lets just say it didn’t go over too well. Here’s the thing… I’m going to be completely honest with you. I am not a baseball fan. Why? Because I’m from the South. Sure they are plenty of southerners who love baseball, but the sport really isn’t as popular as it is up North. 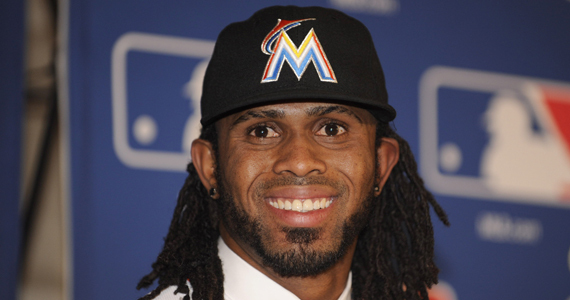 So, I approached this task of critiquing the Miami Marlins’s new look as objectively as possible. And the verdict is … it’s not that bad, it has kind of grown on me. Honestly, the first time I saw this new logo, my reaction was, like most people, “Sweet baby Jesus that is bright.” The colors are black , orange (technically red-orange), silver, blue, yellow and white, and the logo somehow incorporates all of them. How does one go from a lovely shade of blue and black to this… dude rainbow? Yes, that is what I am calling it. It’s a dude rainbow. But, when you step back and look past that fact that it will probably glow in the dark and/or burn out your retinas, you might realize that all these colors sort of compliment each other. I mean, really. When you think Florida, you think orange. What goes best with orange? Blue. Then you gotta have some filler color to make it pop, and good Lord does it pop. So what happens when you have such a vivid logo? You stick to uniform basics for the rest. Black and white. Obviously, the team logo is supposed to be the focal point of the uniform and the black and white uniforms showcase it perfectly. But lets talk about the orange alternate uniform for a second. It’s too much. Sure, other teams use orange as a uniform color, but do they have neon logos? Probably not. Ok, they used a toned down cheaply stitched logo and the base color is really a red-orange. But still… too much. I could possibly be swayed to, dare I say… like it, if I didn’t know that the uniform will be paired with an orange hat. Seriously Miami, I doubt hazard cone is the look you’re going for. No. On second thought, I’ll like it when the logo doesn’t look like ya’ll ordered it from Etsy. Let’s talk about my favorite part of the uniforms. No pin stripes! Not one of the uniforms has pin stripes. And I love it! Now, before you start calling for my head on this one… I’m normally a proponent for pin stripes. Who doesn’t love the slimming effect? Baseball uniform pinstripes just aren’t fine enough for my taste. Then there’s all the options. There’s the colored sleeves and pinstriped tops, or the plain jersey with pinstripe pants. It all looks sloppy to me. That being said…. I don’t mind when teams have the whole uniform with pinstripes, it’s a throw back, I get it. But it just doesn’t work for everyone. I’m talking to you White Sox. 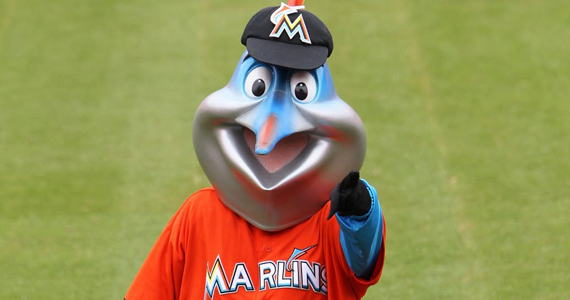 So whats the big deal about the Marlins’ uniform? Whats with all the hate? Sure its jarring. But come on is it really that bad? No. It’s a good business decision. Why are they rebranding? Obviously something wasn’t working. It could possibly be the fact that, for the past ten years, they have been ranked at the very bottom of the league in attendance. And, when your home city has a multi-cultural appeal and retains a lot of Caribbean and Latin culture like Miami does, why not reflect that? If you’re a fan, you’re a fan, you’re gonna go to the games regardless of what the team is wearing. The Marlins want new fans. And how do you get that? Cater to your demographics. And that’s exactly what they did. It’s a reflection of the area and culture. It has a nice Latin/tropical flair to it. It kinda makes me wish steel drums were playing and I had a drink with a cocktail umbrella in it. Who doesn’t like that image? Haters. So my advice to the haters. Just get over it. No one likes change. Accept and move on. It is what it is. I think you should turn all your disdain to the stadium Home Run feature. Because seriously… what is that thing? ?